While her words ring true, it is sometimes difficult to count our blessings when we are enduring some of life trials such as the loss of a job, a divorce, having an illness or losing a loved one. It is precisely during these times when counting our blessings has the most impact. A very simple and powerful way we can remind ourselves of all that we have is to keep a Gratitude Jar. A Gratitude Jar is nothing more than a container to keep track of all the things in life that we’re grateful for. It can be as stark as a large coffee can, or with just a little effort, a decorated mason jar with a colorful label will do the trick. Keep the jar near some slips of paper or a pad, along with pens or pencils. Then write down the things you’re grateful for. Write them down whenever you think of them, or make it a routine to write one or more down every night before you go to bed. 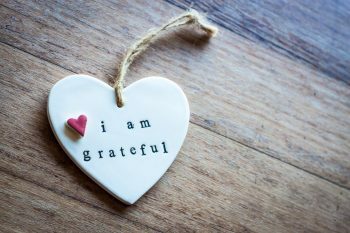 By doing this simple practice of focusing on what we’re grateful for, we become more positive in our outlook. When we’re feeling sad or depressed, a quick read through the contents of the Gratitude Jar can help us regain some perspective. This is good therapy for our souls, especially during life’s difficult times.